So, you've finally recorded your album/EP and are about to embark on the daunting process of manufacturing and distributing CDs. Everyone will tell you that the next step is to publicise your work. No-one is going to buy it if they have never heard of it, are they? But publicity is an expensive business. If you have already checked out costs with a few publicity agents, (and we recommend that you do), you may have been surprised at just how expensive! So you think maybe you will try promoting the CD yourself - as I did when I released my first album a few years ago. Let me tell you, it can be a long, hard, and laborious business - and, certainly at first, the rewards will be few. It can be worthwhile in your local area, but the cost of mailing out your CDs and press kits to all those individuals around the world, (on top of your recording/manufacturing costs), can be prohibitive. And, all too often, you hear nothing back from the station in the end - that can be soul-destroying! After two years I had begun to build up some success, getting playlisted on some stations, receiving local and international plays/reviews, and even reaching No.1 for 14 weeks on one 'Celtic' internet station! Then I finished recording my second album. Hopefully, I was learning now from a lot of the mistakes I'd made with the first one. But this time I was crossing into a new genre, (in this case the Christian market), with all that same work to do over again! I decided to take a shortcut and, to break into this new market, I sent my CD for approval to a compilation CD, where it was accepted. I took the plunge and paid for one track - the best one in my, and others, opinion - on a CD which went out to 500 presenters, (people I would never have had contact with). This was the best money I'd ever spent! Many of these presenters have since requested a copy of my album and are continuing to play tracks regularly on air. I have not managed to hit the Billboard charts, yet - but that CD is getting airplay each week, all over the world! So, I decided to take all the effort that I have put in over the years, (contacting folk/Celtic/roots radio presenters and building up a relationship with them), and to put it to work for others in the genres that I am familiar with. Hence, the birth of CelticRootsMusic and CelticRootsRadio! I tried the idea out with a number of radio presenters that I'd built up a rapport with. The response was encouraging. Next I approached a number of fellow artists in the same genres, to see if they'd be willing to sign up - and again a positive response! As an added incentive we also launched CelticRootsRadio, our new internet (webcast) station - now playing on Live 365! 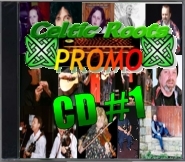 We are currently putting together our first Compilation Promo CD of Celtic Roots music. Artists are encouraged to submit tracks from their album for inclusion on this promo. This CD will be sent out to Celtic, folk, Roots and acoustic music radio presenters, journalists and websites, all over the world. To submit your music, you will need to have a CD, either ready for sale, or nearing completion. Submit one, or more, songs from your CD via SonicBids, (Entry cost: $8 for first song, $3 each additional song). The songs submitted will ALL be considered for inclusion on the next available compilation. We will email you if we consider your songs suitable for inclusion on the promo. If selected, and you decide to take advantage of this opportunity, you will then need to supply us with a copy of your album and pay the relevant fee, (see below). You will receive 3 copies of the Compilation CD for your personal use. You will also have at least one of your submitted album tracks automatically playlisted on our own Celtic Roots Radio station and podcast show. We cannot guarantee airplay on other stations, but we will provide you with feedback and information about airplay, etc. of your song, as we receive it from the DJs and journalists who obtain the Celtic Roots Promo CD.